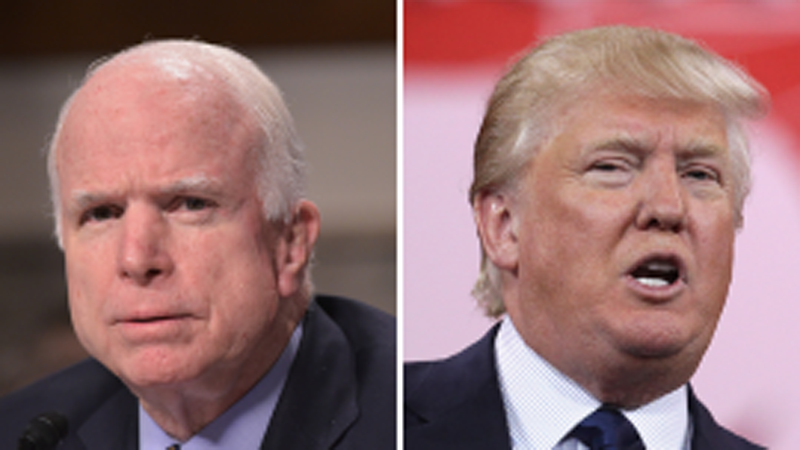 Sen. John McCain (R-Ariz.) lashes out at President Trump in a new book, saying the president seems to care more about "the appearance of toughness" than American values. "He has declined to distinguish the actions of our government from the crimes of despotic ones," McCain writes of Trump in a newly released excerpt from his new book, "The Restless Wave: Good Times, Just Causes, Great Fights, and Other Appreciations." "The appearance of toughness, or a reality show facsimile of toughness, seems to matter more than any of our values," he continues. McCain, 81, also writes that this will be his last term in the Senate, a fact he said a brain cancer diagnosis forced him to admit last year. "I'm freer than colleagues who will face the voters again. I can speak my mind without fearing the consequences much. And I can vote my conscience without worry," McCain writes. "I don't think I'm free to disregard my constituents' wishes, far from it. I don't feel excused from keeping pledges I made. Nor do I wish to harm my party's prospects. But I do feel a pressing responsibility to give Americans my best judgment." McCain also laments the "decline in civility and cooperation, and increased obstructionism" he has witnessed in Congress. However, he says there are remaining lawmakers and officials in the federal government who are "committed to meeting the challenges of the hour." "They might not be the most colorful politicians in town, but they're usually the ones who get the most done," McCain writes. He also pushes Americans to seek presidential candidates who promise to create relationships across political parties and are willing to compromise to address national issues, saying that "their humility and honesty commend them for the job." "Before I leave I'd like to see our politics begin to return to the purposes and practices that distinguish our history from the history of other nations. I would like to see us recover our sense that we are more alike than different," McCain writes at the end of the excerpt. "We are citizens of a republic made of shared ideals forged in a new world to replace the tribal enmities that tormented the old one. Even in times of political turmoil such as these, we share that awesome heritage and the responsibility to embrace it." The excerpt comes as McCain undergoes treatment in Arizona, where he has stayed since December. The former GOP presidential nominee has spoken out about Trump before - he said during an interview last year that he doesn't think the president has any "principles and beliefs." McCain's book will be released on May 22.